Right now I can’t live in New Orleans. B and I have tried to figure it off one way and up the other, but for right now, it just won’t work. And since we can’t get down there as often as we’d like, we love to surround ourselves with mementos of our favorite city. We’ve designated our dining room as our NOLA room – we have our Muses shoe in there, local NOLA photography, an old school Mardi Gras poster and fleur de lis everything. 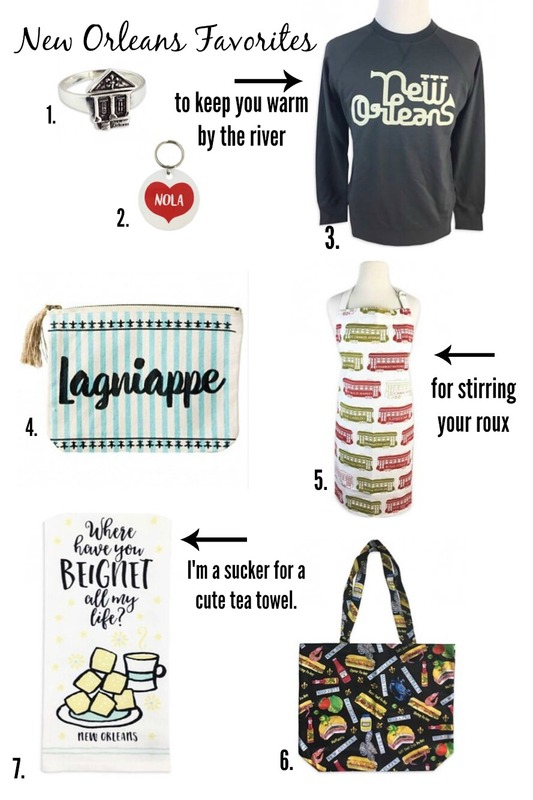 Below are a few more of my favorite things (all from my most favorite store Fleurty Girl!) that are on my NOLA wish list! // 1. shot gun house ring // 2. Funny story – I lost my keys during the New Orleans wedding, and I’m dreaming of this keychain to replace the one I lost. // 3. A cozy comfy sweatshirt. I loooove sweatshirts, and this one is just too cute. // 4. A cute little bag to keep your something extra. // 5. I have a thing for aprons (even though I’m not a giant cooker), and I’ll need something for when I learn to cook a roux. // 6. I don’t think I’d be a proper person if I didn’t own too many tote bags. And everyone should have one with po’boys and muffalettas. //7. I already have 8000 tea towels, so what’s one more? Super extra points because of the cheesy pun. I also really want a Blue Dog , but since I don’t have 10 G’s just hanging around, I’ll settle for my cute little prints I can get at the French Market. That tea towel might be the best thing ever! I dont have any aprons but I think they are so cute and I clearly am going to need one for all the cookies I start making with Zoe, right? Love all your NOLA picks! I need that tea towel in my life!